Below: Rick Blanzy, Julie Lillo, Doug Chapman, Kippie Marbut, Eileen Sweeney, Brittany Marbut, Jeff Benedict, Loretta Benedict, Clarence Benedict, Rico Lule, Fena D'Ottavio, Kevin Benedict. 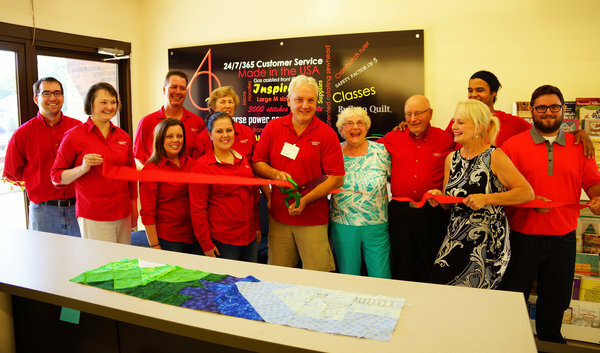 As the long-arm quilting machine business races headlong toward a more than $6-million a year benchmark, the dynamic team at Accomplish Quilting has settled in nicely at their new headquarters in St. Joseph, celebrating their ribbon-cutting ceremonies on Friday on spacious new quarters that will help them achieve even greater performance well into the future. Now a three-generation business, the locally owned and operated company is at the top of its game and continues to lead the nation in sales, training, and more for an industry that is enjoying a major resurgence thanks to the unique opportunities it brings to a hobby that has been amazingly streamlined due to the automated technologies. Company President Jeff Benedict and his team welcomed Cornerstone Chamber of Commerce members in celebrating the 4pm ribbon cutting ceremonies in their new building across from the John & Dede Howard Ice Arena in St. Joseph -- a building that was the decades-long home of the former Schneck's Supermarket and more recently a Dollar General Store. Benedict has taken the reins from his parents, who started the business in the basement and garage of their home, and now Jeff's own son is doing some work for the company, creating a third-generation in the business. Accomplish Quilting was founded in 2001, and moved this spring from space in the former Stevensville Post Office to their new quarters. That move was necessitated by their overwhelming growth pattern in the 15 years they've been on the scene. The Stevensville site was just over 2,600 square feet and their new showroom, demonstration center and teaching labs comprise more than 13,700 square feet at 810 Napier Avenue in St. Joseph just off the intersection of Napier & Niles. Jeff is especially ecstatic over the move. As he told me back in mid-January when they purchased the St. Joe building, "The limited space where we are has been holding us back from growing, so the new space will be fantastic for growth. Accomplish Quilting is the nation's largest provider of Innova long arm quilting machines. The company's growth spurt is also being felt in their Goodlettsville, Tennessee location, which will also undergo a sizable expansion in the near future due to the substantial increase in interest in quality quilting technology. 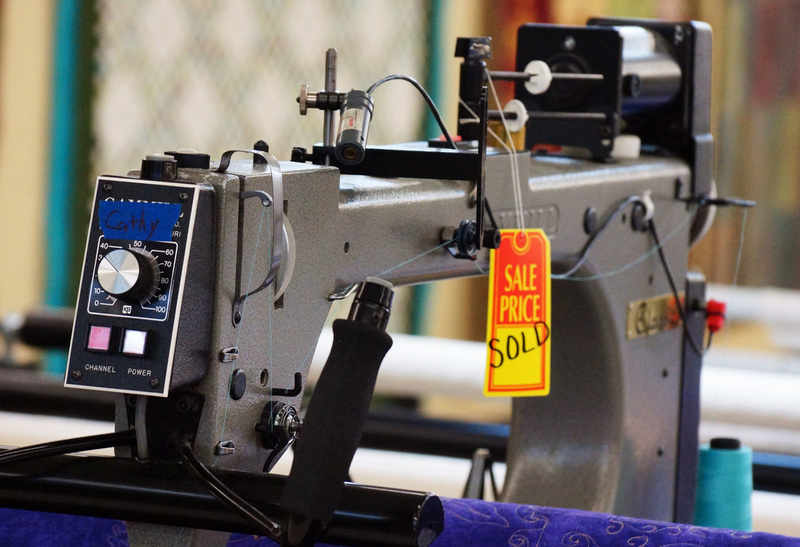 In addition to being one of the top long-arm equipment sellers in the nation, Accomplish Quilting also provides a multitude of accessories and quilting supplies, all quality-tested by their in-house staff or recommended highly by industry professionals and veteran customers. 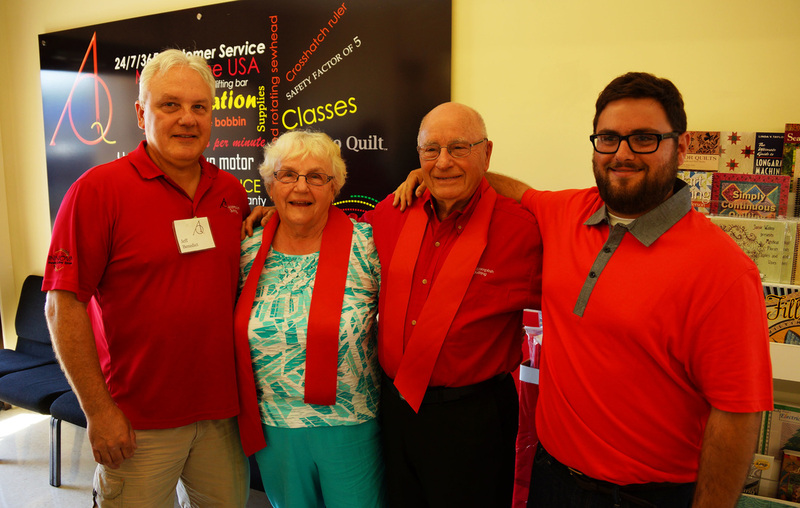 Pictured below: Left to Right-Jeff, Loretta, Clarence and Kevin Benedict. 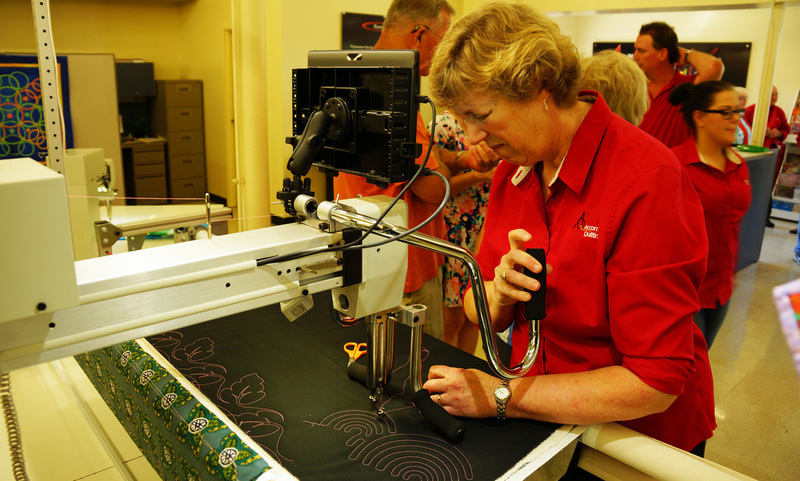 Sales/Instructor Eileen Sweeney demonstrating one of our Innova Longarm Quilting Machines. Eileen is a master quilter as well! 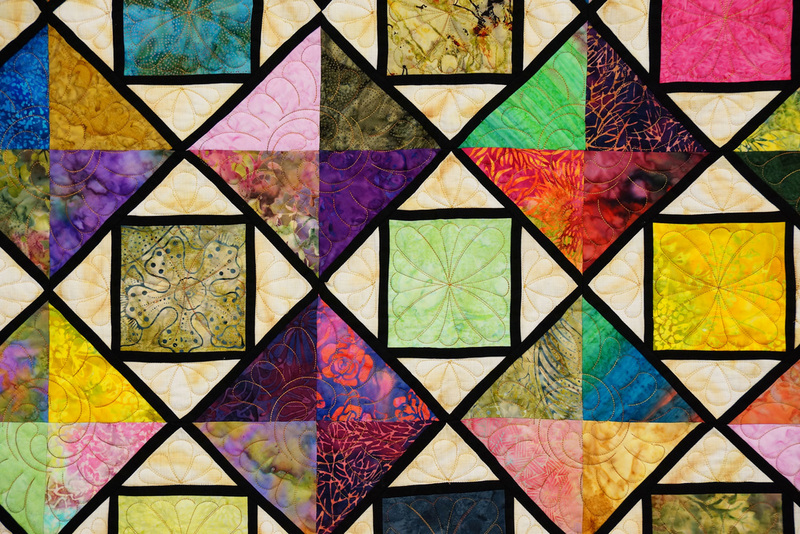 This Stained Glass Quilt was pieced and quilted by Jeff's Mother! She was the quilter of the month for the month of our open house. . The Innova AutoPilot Longarm quilting machine. This machine does computerized/automated edge to edge quilting. Accomplish Quilting takes services and takes in trade every make and model of quilting machine. As you can see, this traded-in machine is destined for a new home! Pictured above: The previous Accomplish Quilting located in the old Stevensville, Mi. Post Office. There's nothing like a blustery cold winter's day, when a good, old-fashioned hand-made quilt is pulled into place to tell you about the exciting new growth for the power team at Accomplish Quilting of Stevensville. Company President Jeff Benedict and his crew will relocate this spring to the building that was home for decades to Schneck's Supermarket and later Dollar General in the Southtown neighborhood of St. Joseph. Having outgrown their space in the former Stevensville Post Office over the past several years, Accomplish Quilting will perform a makeover on the former store at 810 Napier Avenue in Benton Harbor after closing on the deal to buy that building last week. The new space will more than quintuple their available work and display space when compared to the building in Stevensville. The Napier site is 13,700 square feet, while the former post office building checks in at 2,612. Jeff tells me, "The limited space where we are has been holding us back from growing, so the new space will be fantastic for growth." 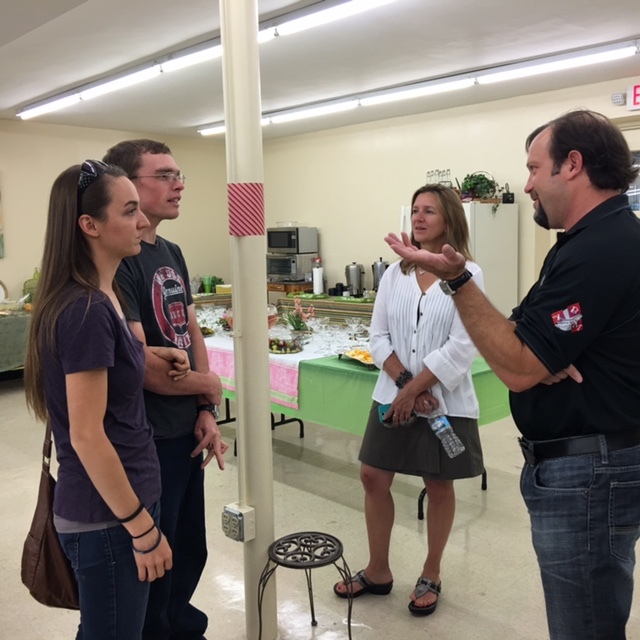 That new growth could include new employees as the business gets bigger. The retail showroom will likely comprise some 5,000 square feet of the new building, providing lots of room to showcase their premier line of Innova long arm quilting machines as well as trade-ins from folks who have upgraded their systems as they become better at the art of quilting. Accomplish Quilting was founded in 2001 and has become a national leader in the sales and service of long-arm quilting machines. They expanded operations into Goodlettsville, Tennessee a couple of years ago, and now will relocate their corporate headquarters and retail facility to the space just off of Napier and Niles across from the John & Dede Howard Ice Arena and Van's Pharmacy. Meanwhile, Realtor Pete Jorgensen will be entertaining inquiries regarding the old space at 2797 Kimmel Street in the Village of Stevensville. 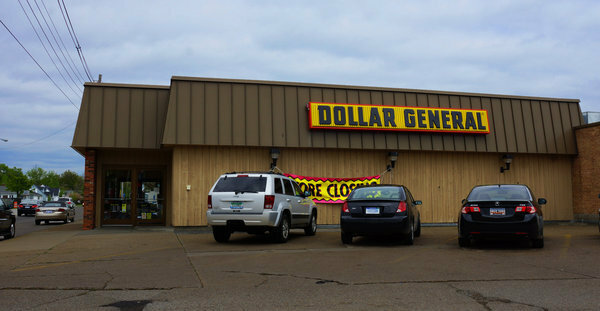 The Dollar General store building closed back in June and the property was sold at auction in recent weeks paving the way for this new home for Accomplish Quilting. As one of the largest and most successful long-arm quilting machine sales generators in North America, Accomplish Quilting has built a substantial and loyal clientele thanks to not only their expert sales team and talented instructors, but also thanks to a team of technicians that have proven to be second to none in the industry. Accomplish Quilting has around ten employees on staff. 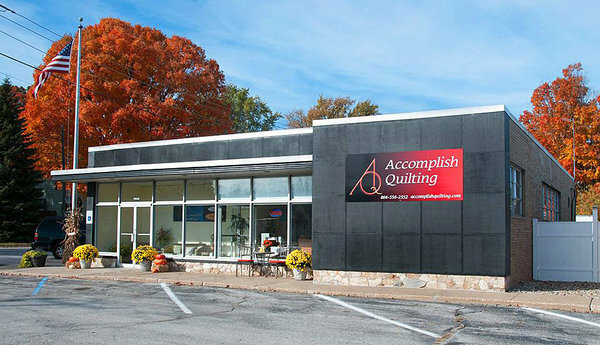 The team at Accomplish Quilting also delivers outstanding training to long-arm buyers and users with free, in-depth demonstrations at the dealership as well as tips, techniques and other information through their online presence and video instruction programming. 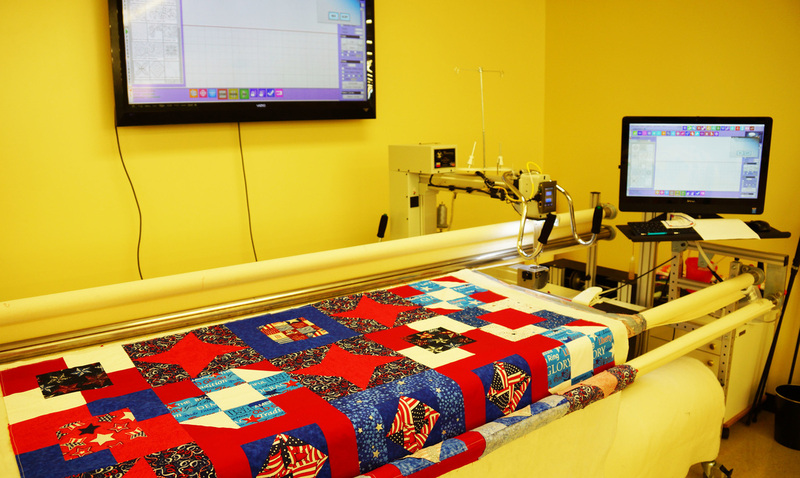 In addition to being one of the top long-arm equipment sellers in the nation, Accomplish Quilting also provides a multitude of accessories and quilting supplies, all quality-tested by their in-house staff or recommended highly be industry professionals, and veteran customers. Accomplish Quilting also fields an army of sales representatives elsewhere in Michigan, Indiana, Illinois and Pennsylvania as well as their satellite office in Tennessee.